Showing my seven-year-old stepson, images from the Hubble space telescope and satellite pictures of the Earth, I was surprised by his blasé nature of the subject matter. His interest in such a remarkable ability and to see what our ancestors, even up until recently, would have considered “knowledge of the gods”. His lack of interest or his already acclimatised young mind has taken such privileged information, which took thousands of years of accumulated knowledge. With billions of pounds worth of space budgets to acquire, and most of his generation, view such images as, “boring”, using his words, not mine. 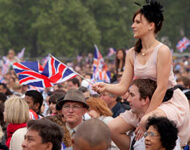 This situation got me thinking about our modern lifestyles and the queen’s jubilee again. Have we witnessed and experienced, in the new Elizabethan age, the pinnacle of human achievements? We managed to explore the solar system, walk on the moon and look deep into the universal past, without realising, that, like people sitting on shoulders at festivals, the view would only be for a limited time. Using the festival revellers analogy again, weakness, caused by the depleted energy resources of the unlucky bottom lifting party goer, will eventually bring the lucky shoulder surfer back down to earth with a bump. The new Elizabethan age is the high peak of two thousand years of exploiting the use of oil, from the lamps which lit-up Roman villas, to the massive plant machinery which now construct our buildings. However, we have become complacent. It was only in the 1950’s that the many modern uses of oil, such as Nylon, advanced plastics and paints etc., were invented, and we have all been on a modernisation and consumption frenzy since. Our childhood has acclimatised us all, that everything we have grown up with is the norm. As the wonders of the solar system are “boring” to the newest of human generations. This unique relationship between humanity and oil tankers taken for granted. Were simple food thank for’ in prayer, in my grandparents’ generation; today we think nothing of obesity. Is this complacency? Is this the pinnacle of human achievement, or both? With a pinnacle, always comes a drop. This situation is why I have dedicated my life to promoting the use of solar panels. I am not complacent; I can see the drop on the other side, like one-half of a rugged mountain. Steady meandering declines and sharp reductions in equal measures. The need for solar panels will grow equally alongside the growing cost of oil and the goods it produces. Our consumer feeding frenzy over last few decades and the universal pursuit of a cheap toaster, has inadvertently shortened the lifespan of the modern oil age. The rest of the world now wants to join the party too. As children who have grown up surrounded by the creature comforts of our age, western humanity has unintentionally lost humility with our place in the world. Thousands of years of striving knowledge of the stars and our place in the cosmos have in one single generation become complacent. If humans continue this blasé complacency towards oil, then our free view of the universe which our oil-based civilisation has given us will be revoked. The party is nearing the last crazy hour, the lubricated have drunk most of the keg, and like any good party, the consequences will be messy. I love solar panels because of their importance within the human story because just like Paracetamol tablets, you will only be appreciated them after the party has ended. Future generations will once again look up at the stars in wondrous curiosity and still debate what they could be.